David A. Chappell, M.D. is a 35-year expert in managing obesity, diabetes, hyperlipidemia, hypertension, and other obesity-related complications. Dr. Chappell has excelled in the medical field since completing his internal medicine residency at Barnes Hospital Washington University in St. Louis, and his endocrinology fellowship at University of California, San Francisco. 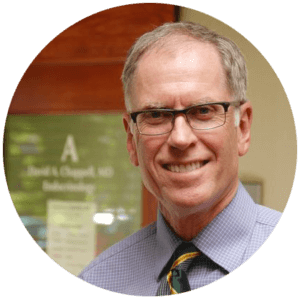 As a board-certified physician in internal medicine and endocrinology, Dr. Chappell is a consulting physician at Petaluma Valley Hospital and Novato Community Hospital. He has served on the faculty of UCSF and University of Iowa College of Medicine, and earned recognition from the National Institutes of Health for his research. During his time in the medical field he has authored numerous research documents is recognized as a leading physician in the field of weight loss with Institute of Health Management (IHM) . He was a participant in IHM at its inception by Dr. Robert Park, M.D., a well-known nephrologist who started the clinic in 1985. Under Dr. Chappell’s supervision since 2016 the clinic has enhanced the maintenance programs that consolidate the spectacular weight loss reductions seen with those who follow the modified fast. Moreover, in a separate practice setting, Dr. Chappell is one of a handful of concierge physicians in California who practice personalized endocrinology and primary care. Dr. Chappell has a strong research background with over 30 publications of original research in cholesterol and fat metabolism. He was a professor of Internal Medicine at UCSF and University of Iow prior to open his practice in Petaluma, CA in 1998. Dr. Chappell is expert in the use of all FDA-approved weight loss medications, general endocrinology, and general internal medicine. I joined IHM this past year and knew the approach would work for me. I’m in a size 4 now and feel fantastic. My energy level during the fast was great. The weekly group session was a major key in portion control and making good food choices. This has been a complete and astonishing success that is inspiring friends around me.